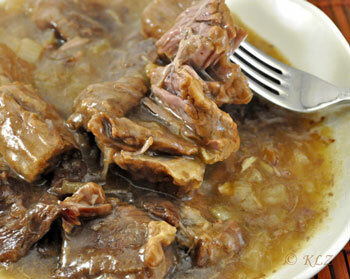 Beef and Onions Braised in White Wine, from Thyme for Cooking. Beef is more traditionally braised with red wine, but using white wine can give your dish a lighter, more delicate taste. Put beef, onions, garlic, and bouquet garni into a deep bowl. Combine wine, vinegar, Calvados, bay leaves, salt and mustard. Pour over beef and marinate, refrigerated, for 6 - 24 hours. When ready to cook, remove beef and drain, reserving marinade. Add beef, a few pieces at a time, and brown, transferring to a large, oven-proof casserole. When all the beef is browned and in the casserole, pour the reserved marinade and onions over. Put into the oven and braise, 350F (175C) for 4 hours, checking occasionally and adding more wine or beef stock if it starts to dry out.. Remove beef to a platter and keep warm. Add corn flour mixture, a little at a time, stirring until thick. You may not need all of it. Spoon some sauce over the beef and serve, any remaining sauce on the side.